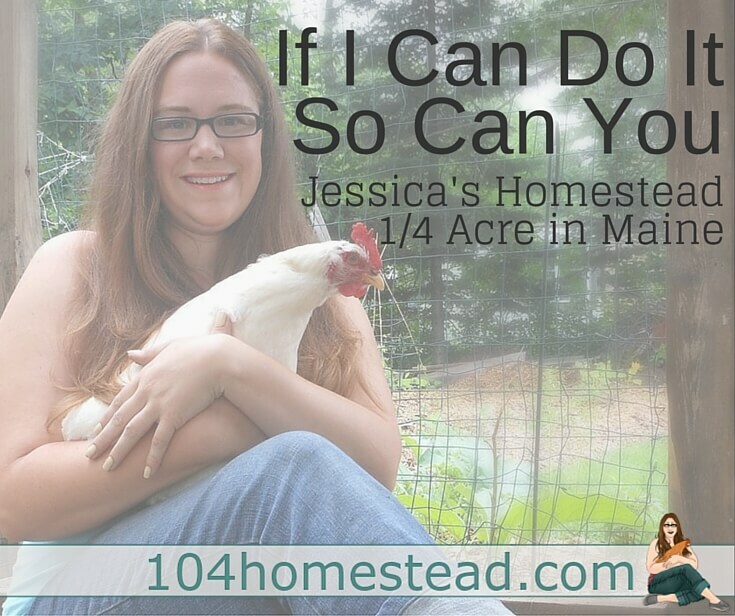 Homesteader Profile: Jessica is a married mother of three. She is a writer (The 104 Homestead) and stay-at-home mom. 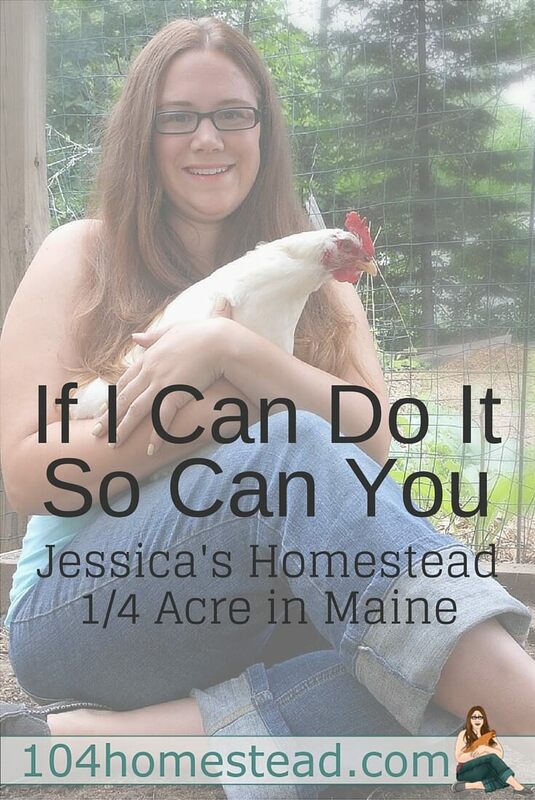 Jessica lives on 1/4 acre in Maine. She maintains approximately 850 square feet of gardens (growing zone 5B). I had been interested in DIY and frugality for a very long time. I had gotten into gardening when I purchased my first home. What drove me from a hobby to a lifestyle was a book I read called Mini Farming: Self-Sufficiency on 1/4 Acre. The author showed me that I could do so much with the land I have. What I considered a small property was actually loaded with possibilities. The only thing I had to contend with was land restrictions and neighbors because my home is right in town. In addition to my gardens (which I am always adding to), I also have a small crab apple tree that allows me to make apple butter and jellies. I hope to add more fruit trees along my property line because they are both attractive and functional. Keeping things aesthetically pleasing is important when you live right in town with close neighbors. I try to landscape with the foods we grow. I train sugar snap peas on the mailbox and sneak herbs into my perennial beds out in front of the house. On my small homestead I raise a variety of poultry. My current flock consists of two Swedish Blue ducks (a hen and a drake), nine adult hens of various breeds (I love a colorful egg basket), one small chick who hatched out this winter, and nineteen eggs in the incubator. My plan is to add another duck or two as well as Coturnix Quail this summer. I’m very excited about getting into quail breeding. The eggs from our birds more than covers the needs of our family. 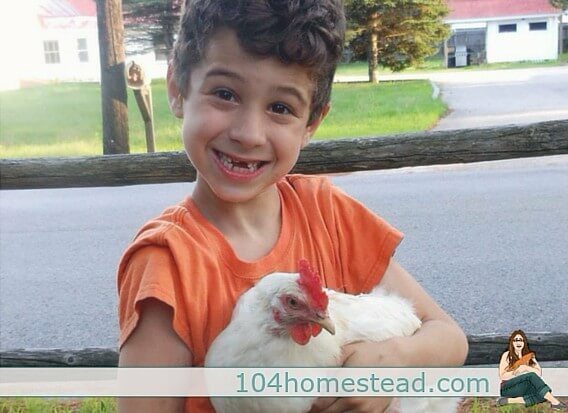 Every kid should grow up somewhere that they can hug a chicken. I run a little roadside farm stand that I have open from spring to fall. In it, I sell excess produce from the gardens and any extra eggs we have. It is run on the honor system and I have yet (knock on wood) to be ripped off. I sell eggs year-round to my most loyal customers. This year I am partnering with my local health food store to sell some of my surplus eggs and produce. I am always looking for new ways for our homestead to pay for itself. As it stands, our egg sales cover the cost of the chickens and our produce sales cover the cost of seeds. Many changes have been made inside my home as well (beyond the occasional chicken in the kitchen). I try to line dry all of our laundry, even in the middle of the winter. I also stock our home with natural DIY cleaners and daily use products that I make from scratch. We have learned to reduce waste by using unpaper towels and recycling or re-purposing what we use to consider trash. Nothing goes in the trash can until it has been used to the best of its ability. Many things that use to be thrown away are now composted. We have our compost bin in with our chickens, so they break down things quickly to make beautiful, rich compost for the gardens. Possibly the biggest change in our home is the interaction with our children. I have discovered that there are endless opportunities to educate our children in simple living, self-sufficiency and those great “old-fashioned” skills. My hope is that some day they’ll pass this wisdom on to their own children. My biggest piece of advice would have to be, you can do whatever you set your mind on. You might not be able to do things the traditional way. Urban homesteading requires a bit of creativity, but it’s completely worth the effort and planning. I’ve been following you on Instagram and just ran across your blog when I was looking through Pinterest about homesteads. I love reading about other unconventional homesteads, because everything you mentioned above is very similar to what we do! Your blog is so inspiring to me! I live in an apartment right now, but my boyfriend and I are hoping to have a house in the next 2 years. We’ve even considered moving to Maine, so reading about your story is so helpful to me! I love that you’re doing this in a more populated area, too, because I think that can always be more tricky with zoning and neighbors and all. I’m sorry. I use to have a page dedicated to my gardens, but the program I was using to display them went wonky. They are scattered through posts, but I will work on getting that page back up for you to reference. Where in Maine? I’ve been here 6 years and have yet to meet any like-minded folks. We’re in Topsham and this is going to be our first season with a committed garden. I am so excited to start easing into homesteading. The dream is to get a little land in a few years. I’ve been to the Topsham area. I’m over on the Maine/NH line in the Mt. Washington Valley. What an inspiring post! It is amazing all that you do with just 1/4 of an acre! I hope to do the same soon. I shared your story on my Facebook page “Green Thumb Journey”. Good luck during the winter! Thank you Eva. We try pretty hard. I’m not sure if we will ever be fully self-sufficient here in Maine (we have a very short growing season), but I’m eager to keep trying. What stopped me in my tracks is how much my Granddaughter looks just like you. She is 12 years old and a wonderful young lady. We live in a large Pacific NW city so the odds of her ever having a Urban Homestead will probably not happen…but seeing all of the things that you and your family are doing, planning truly is inspirational and makes me feel that the world is ready for her, you and other young people of today. I like that expression, “Reach for the Stars,” and I am hoping she will have the fortitude and never give up striving for that goal. Thank you so much. You never know, urban homesteaders are growing in numbers. Do you need a permit to sell your produce in your road side stand? I love what you are doing! We are looking to do the same thing, except we are living in Chile! It depends on where you live. I didn’t need one for mine, but I cannot sell raw milk and I cannot market as organic (even though it is). Love the post, I’m a mother and wife, ( 2 boys 9/13) I’m am currently trying to become self sufficient, every little tip helps, I just finished making my own irrigation system for my gardens.so fun and I’m so proud. Keep the advice coming. I’m always surprised at what people do with what little they have! It’s awesome what you’re doing with 1/4 acre. Thanks for being the first commenter on my blog, by the way! I really enjoyed your post. Keep up the great work! I can’t wait to read that book! I’m not very good at gardening but I’m hoping to get better! She really makes it so easy. She breaks down types, quantities and how to arrange them. It’s so helpful! Just be aware. She’s a fan of double digging and if you’ve read our latest Gardening & Outdoors post, it’s a topic of great debate. 🙂 Good luck with your gardens and I hope I can be of some help along the way. Have you considered grafting various apple varieties on your crabapple tree? We have 6 crabapples sprinkled around and I didn’t do anything with them as we were busy using and preserving the glut from our regular 7 apple trees and the crabapples Aeemed less desirable. What a waste! I’m going to try grafting so we can get a more diverse harvest of full size apples. I’ve been reading up about it, but have yet to be brave enough to try. I also want to make my own 5-fruit tree at some point. I love, love, love your blog. I am 66 years old and I am trying to become a homesteader on less than 1/4 acre. You give good advice and tips. That warms my heart to hear. Thank you! Thank you for sharing, I immediately requested the book Mini Farming: Self-Sufficiency on 1/4 Acre from the library, looking forward to read it too.